of St. James Park Station, London. The Metropolitan Railway and the Metropolitan District Railway (District) were the first two underground railways to be constructed in London, starting in the 1860s, and the first of the world's metro systems. Although separate and independent and often fierce rivals, the histories of the Metropolitan Railway and the District are inextricably linked through their joint construction of the Inner Circle (now the Circle Line). The Metropolitan Railway was closely associated with the Great Western Railway and could be seen as a 19th century precursor of Crossrail. The rapid expansion of road traffic into London in the first four decades of the 19th century had stimulated many proposals for railways into the central area including a number of schemes for underground routes. Charles Pearson, Solicitor to the City of London was a leading promoter of several of these schemes and in the early 1850s did much to win government approval for the construction of the first of these lines the Metropolitan Railway. 1853 The Metropolitan Railway was incorporated as the North Metropolitan Railway and was re-incorporated on 7 August 1854 as a mixed-gauge line: it opened on 10 January 1863 from a junction with the Great Western Railway (GWR) main line at Bishops Road, Paddington to Victoria Street (later Farringdon Street) in the City of London. The broad gauge was removed in 1869. 1864 The District company was incorporated and owns 24.5 miles of line, besides about 3.75 mile held jointly with others. 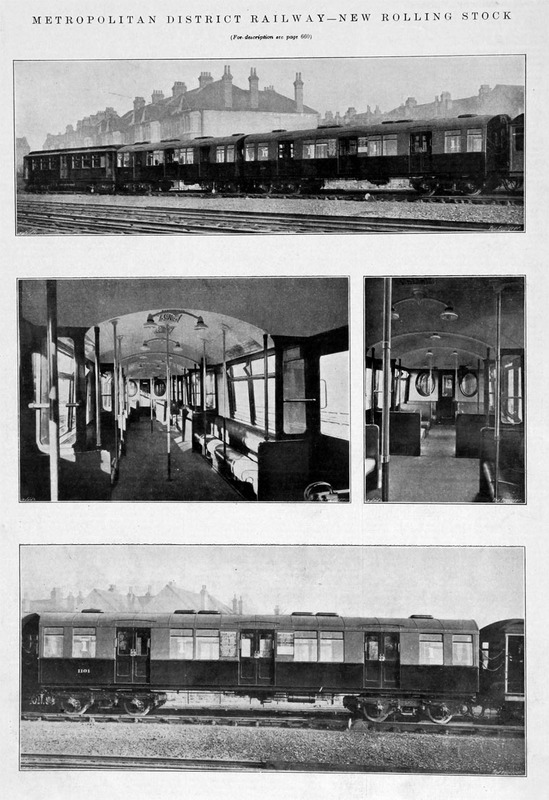 1900 The MDR began electrification, to replace steam locomotive operation; the electrical equipment used on the tube lines was on the same general principle as that already adopted for the MDR: third and fourth rail. Eventually, the system would become standard for the whole of the London Underground. 1901 Charles Yerkes formed the Metropolitan District Electric Traction Company to electrify the District Railway and to build Lots Road Power Station. In 1901 and 1902, Charles Yerkes's Underground Electric Railways Co purchased the struggling Metropolitan District Railway - now the District Line - and four embryonic underground railway companies. 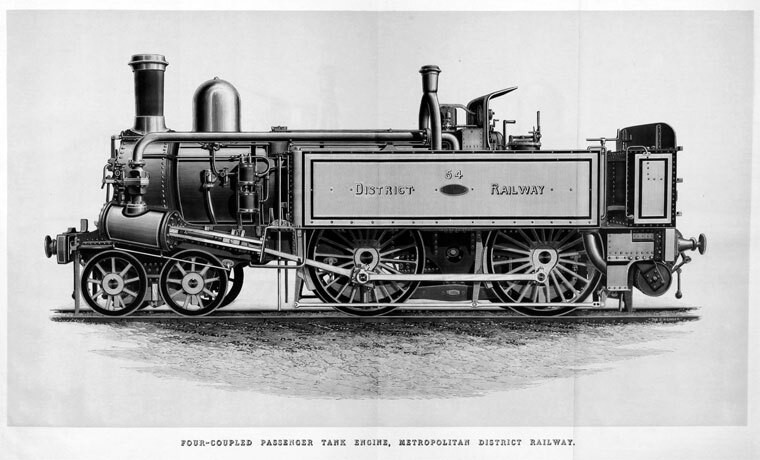 1901 The Metropolitan District Railway had been making considerable experiments with a view to converting, under powers given in 1898, its lines from steam-working to electric traction, and had decided upon the use of direct current, proposed by the American interests, headed by Charles Yerkes, who controlled the railway. 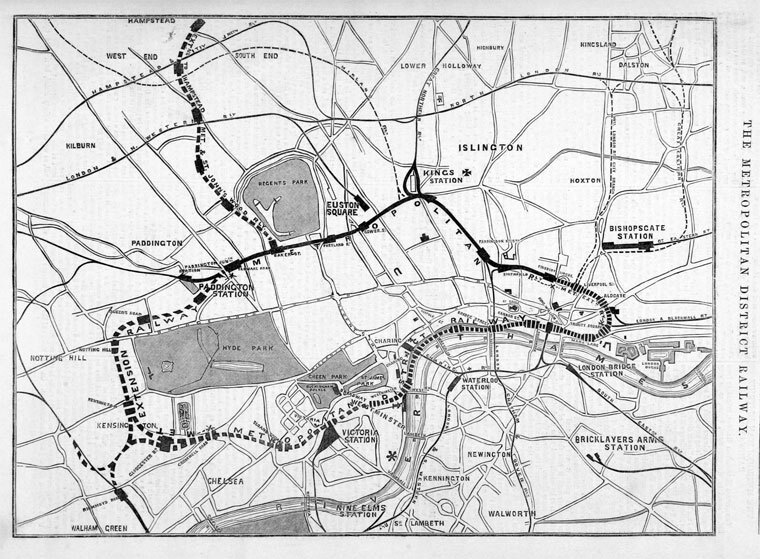 Inasmuch as the Metropolitan District Railway worked a certain proportion of the Inner Circle trains over the section of the District lying between South Kensington and Mansion House and was a joint owner of the the line thence to Aldgate, it was interested in the system proposed to be employed by the District, and wanted the alternating method of Ganz, of Budapest. As the two companies did not agree on this point, the question was referred to arbitration by the Hon. A Lyttelton. The hearings were begun in September, 1901, and the award was given in the following December. Like its chief director, the engineer-in-chief and general manager of the company was an American, James Russell Chapman, and much of the equipment used on the lines was imported from the United States. Specially-designed passenger rolling stock was required and because of the original American influence, these have been termed "cars" on the London Underground rather the more usual British term "carriages". 1911 Lifts were supplied by the Otis Elevator Company of New York. The first railway escalator came into use on 4 October 1911 at Earl's Court between the Piccadilly and District Lines. This page was last edited on 4 May 2018, at 11:00.